Everyone got their comfy clothes on? A cup of hot coca? 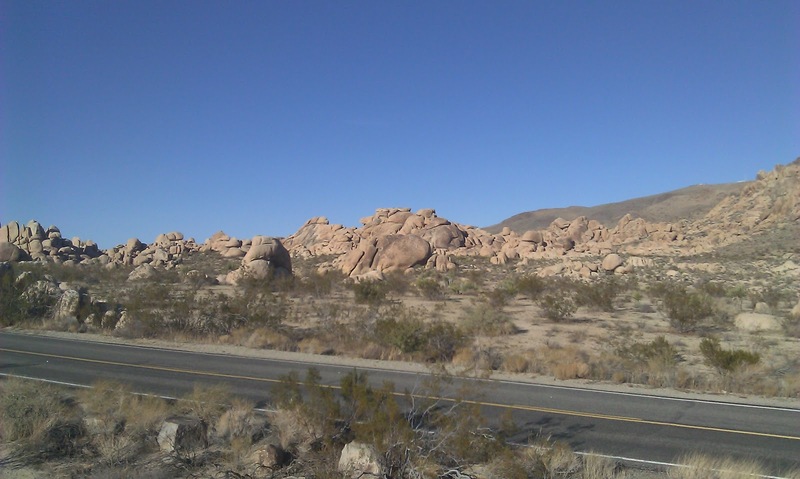 Good, well settle in and let me tell you the tale of my trip to Joshua Tree National Park. BTW- this post is so epic, it had to be split into two parts, Day 1 and Day 2. This is Day 1. The trip started out with me and the girl in the gassed up car and headed West on the 10 to the town of Palm Springs. 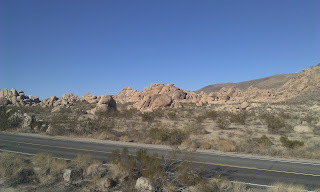 I wanted to hit the Park from the South and work our way North to TwentyNine Palms where we were staying last weekend. I liked Palm Springs and will have to give it more of a go the next time around but managed to take this "stunning" nature shot from which you will learn nothing about Palm Springs. Now with Palm Springs in our rearview mirrors, it was on to the Park! Upon entering the Park, we stopped off at the ranger station, not only to pay our car fee but also to get a sense of what could be done in the Park. We were on auto-tour mode for the weekend and the Ranger recommended some good places to stop off on our way to 29-P.
Little did he know that I would be stopping every 10 minutes to take pictures of random Joshua Trees, bwahaha, haha. Ha. and while there WERE roads like that (that are not Saturn-friendly so don't even try it), most were asphalt and well maintained with not too deep sand on the sides to get your tires stuck. 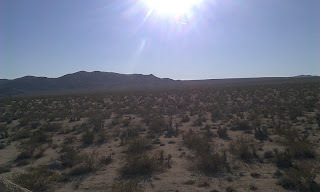 The second observation upon entering the Park is how much of a desert it actually is. 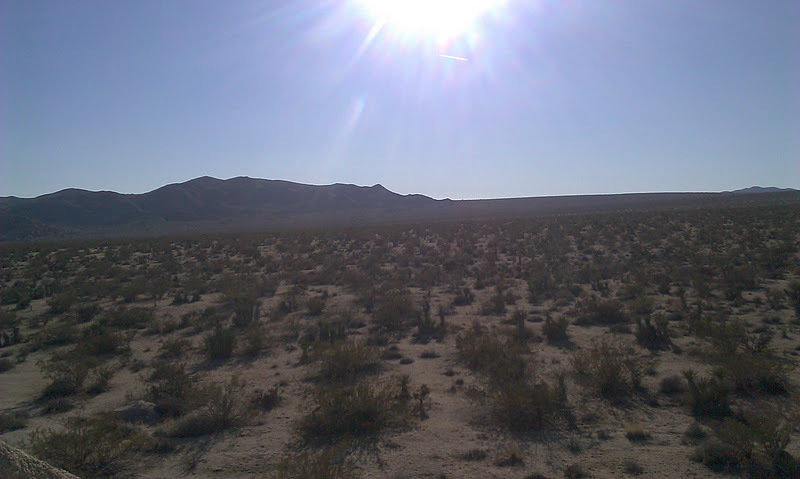 Especially in the Southern/Colorado Desert region, there is a lot of sparse vegetation and sandy landscapes. A second observation was that JT is really, really big. One of the things I liked best about Joshua Tree is the vastness of it. It really takes the entire landscape and makes you feel small. I had yet to be in a place that says, "whoa now, to us you are an ant" but Joshua Tree has the uncanny ability to do that to you. As we went further North in the Park, we decided to get out at a few places and amble about. Most of these places involved millions if not billions-year-old boulders. Don't get me wrong, I am not a "bouldering" guy, but if "scrambling" on the boulders is involved, sign me up. One thing about JTNP, the specific stops at campgrounds and the like will have the most concentration of people. Concentration meaning only 15 or less but if you want to scramble about, prepare to either wait (which I did) or share. Want to see my narcissistic self in action? Of course you do! Now let me say a few controversial words about Joshua Tree. I really liked it for its otherworldliness BUT it just seemed a bit too desert-y for me and the mountains were just made of volcanic boulders. Of course, that is part of its charm and I have hiked in deserts before but at the end of the day, I am an Adirondack'er at heart and think I prefer the mountains over the desert. That being said, I really did enjoy the vistas! Having had our fill of boulder country, the girl and I moved on to Crazy Cactus Grove of Doom! Seriously, this place was off the chain, hook and/or pedestal. I have never seen cactus/tree things like this before. They looked so fuzzy and their little fuzzballs at the base of these trees looked like something out of The Trouble With Tribbles episode on the original Star Trek. If you have time, this is a high recommend to go ambling through the grove of these things. but no Joshua Trees. Did they actually exist or are we merely tools in a grand marketing scheme perpetrated by the National Parks Service? Only time would tell but the girl and I had to hit the hotel and you will have to read Part 2. For dinner, we decided to hit up this place called Pappy's and Harriets that was about a half hour away from 29Palms. Now, I know some places are busy but this place was insanely busy and they were kinda rude which resulted in an hour and a half wait without being seated so we lit out for greener pastures. The ONLY positive of this place was this photo. Really, it might be a fine place and you might have enjoyed a rootin, tootin, good time there in the past but I would be happy giving my money to almost any other place other than this one. Still, Pappy's couldn't take away from the great experiences of Day 1 in the Park. Does ADKinLA ever see a Joshua Tree? What is the deal with Fried Liver Wash? 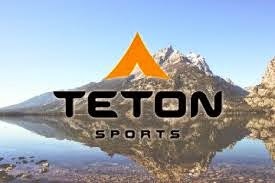 More bouldering? All of these questions will be answered and MORE in the second part of ADKinLA's epic Joshua Tree National Park story, stay tuned! Excellent pics. Can't compare ADKs with the desert, they both have their charms. Haven't been there since I was a kid, and Hubby's never been at all. I think we're going to put this on our list for this winter (summer and early fall just get too hot out there). Also, be sure to make a trip further south down to Anza Borrego, but in the spring. Still deserty, but a very different feel. Spectacular. And the mountains of Julian are nearby -- so definitely worth a long weekend exploring both areas. Thanks guys for the great comments. You are right @tourpro it is 2 completely different deals. @Collen thanks, I had an insane experience my first trip to the Anza Borrego (check out my Whale Peak of DOOM! post) but there is nothing like going through those mountain passes before you get to Julian, spectacular!